British Columbia native Jack Hodgins is best known for his novels The Invention of the World and The Resurrection of Joseph Bourne particularly because of his use of magical realism. He has been recognized with many awards ranging from the Lieutenant Governor’s Award for Literary Excellence, the Governor General’s Award, and the Canada-Australia Prize. He has received honorary degrees from several Canadian universities and was made a Member of the Order of Canada. His many novels and short stories have received wide critical acclaim in Canada, Australia and beyond. Jack Hodgins was born on Vancouver Island in 1938, and later studied creative writing at the University of British Columbia under the guidance of poet Earle Birney. He graduated with a B. Ed in 1961 and went on to teach high school in Nanaimo until 1981. 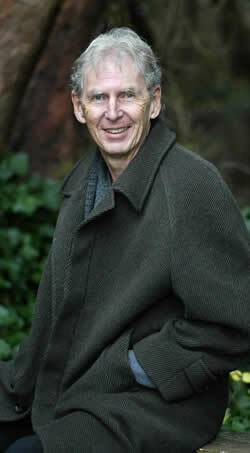 Between 1981-83, Hodgins was a visiting professor at the University of Ottawa and since 1983 taught in the Department of Creative Writing at the University of Victoria until his retirement in 2003. Much of Hodgins’ writing has been influenced by the Comox Valley; which is his birthplace and a popular setting for many of his novels. His first successful publication was Spit Delaney’s Island (1976), a collection of short stories. Many of Hodgins’ narratives deal with sad characters who are eccentric yet true to life. The short stories in Spit Delaney’s Island mix these dejected characters who are limited mentally to what their eyes can see with escapist type characters who are more unconventional and intriguing in their ways. Following Spit Delaney’s Island are the novels The Invention of the World (1977) and The Resurrection of Joseph Bourne (1979) which remain the two most successful works by Hodgins.